“Icarus” won the Oscar for best documentary on Sunday. It went from a Sundance sensation to a must-see movie on Netflix. 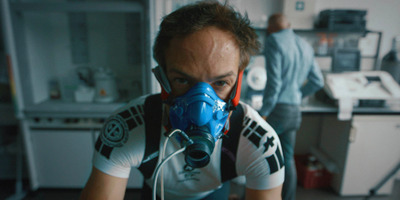 But for director Bryan Fogel, the Oscar win came after a 14-year struggle to find his niche in the business. Bryan Fogel became one of the biggest success stories at Sundance in 2017, when his doping scandal documentary “Icarus” sold to Netflix for a staggering $US5 million (unheard of for a documentary sale). And then on Sunday, it won the best documentary Oscar. But his journey actually goes back 14 years, when his claim to fame was being the creator of an off-Broadway hit show. Struggling to get into the business as an actor, writer, or director, Fogel co-wrote the stage play “Jewtopia” with Sam Wolfson in 2003. It’s a comedy about two friends navigating the Jewish and Gentile dating scenes. It became a surprise hit, with Fogel and Wolfson starring as the male leads during runs in Los Angeles, and then off-Broadway for three and a half years. That play then had a touring production, was put into book form, and even spawned a movie version starring Jennifer Love Hewitt in 2012 directed by Fogel. But that’s when the party stopped. The movie barely got a theatrical run, and was thrust into streaming limbo following its 10% Rotten Tomatoes rating. Following that disappointment, and known around town only as “The Jewtopia Guy,” Fogel was stuck in the bubble Hollywood likes to put people in. But there was one thing that gave him comfort: cycling. Fogel constantly rode his bike, sometimes even riding and doing competitions alongside pros. Around the time of accusations running wild in 2012 that Lance Armstrong was doping throughout his seven consecutive wins of the Tour de France, Fogel, who idolized Armstrong, began to wonder if the blame should be put on Armstrong or the entire system. Armstrong wasn’t the only one doping, though he finally admitted to doing it in 2013. That led to Fogel to an idea. In 2014, Fogel used $US350,000 given to him by a friend and began to make “Icarus.” He hired a team of nutritionists and trainers to chart his progress, and through that he befriended the man who would be in charge of his doping process, a Russian scientist named Grigory Rodchenkov. It took years to find what the movie was. Fogel admitted that the first two years of material hardly even made it in the finished version of the movie. But his “Super Size Me”-like journey to see how performance enhancing drugs bettered his cycling led to a friendship with Rodchenkov, which inevitably became his movie. As shown halfway through “Icarus,” Fogel begins to realise through his Skype conversations with Rodchenkov that he’s a major player in Russia’s doping of its athletes. In fact, he’s the guy. It turns out Rodchenkov is the director of the Moscow laboratory, the Anti-Doping Centre, which does the complete opposite on a daily basis of what its name says it does. The lab, as Rodchenkov shows in the movie, doped the athletes and then carried through methods to make sure they got through the Sochi Winter Games in 2014 undetected. Around the time Fogel got this bombshell from Rodchenkov, producer Dan Cogan and his team at Impact Partners joined the movie, and gave Fogel the financing and support to complete it. This included Fogel’s trip to Moscow to see Rodchenkov at his lab for the final stage of his doping. But then the movie took a drastic turn. Doping allegations toward Russian Olympic athletes begin to come out in the news, with involvement tracing all the way up to Russian president Vladimir Putin. Fearful for his life, Rodchenkov devised a plan with Fogel to get him to the US. Fogel and Rodchenkov’s faces were suddenly plastered all over Russian television, and Fogel claiming his Facebook and email were constantly trying to be hacked into. This led to the movie’s most dramatic moment, Rodchenkov getting in touch with the New York Times in May 2016 to deliver the whistle-blowing story that rocked the sports world. Fogel was there to capture it all on camera. In fact, some of that footage has only recently been included in the movie, as Fogel didn’t have enough time to get it into the Sundance cut. “The movie has the same running time, but we lost 20 minutes of material that was in the Sundance cut, and replaced that with 20 minutes of material that is bringing this story together emotionally. Showing and not telling,” Fogel said, who adds that the story also now goes quicker into Rodchenkov’s story. “So at Sundance we had a lot of [text] cards because we didn’t have the time to put that together.” Also different from the Sundance cut, there’s now animation in the movie. Many will likely connect the events in “Icarus” to the allegations that Russia interfered in the US 2016 presidential election. And Fogel is 100% on board with that thinking. “Icarus” is available on Netflix.